Boring can be done on mills, lathes or drill press machines, either with a boring head or with just a boring tool. The shorter the distance between the tool holder and the material, the less distortion created from vibration or unbalanced gyroscopic effects. The greater the distance (static or dynamic mounts) the more flex in the tool or an increase in the imbalance of a moving tool. Use of a boring head increases the mass of the tool holder and decreases the distance. If a vibration is created it will be at a higher frequency and the deflection of the tool from the desired path will be much smaller and easier to erase through repetitive tool passes. In the case of a dynamic tool (mill or press), the balance of the tool can be adjusted with counterweights if the tool is mounted perpendicular to the shaft or the tool length can be decreased. 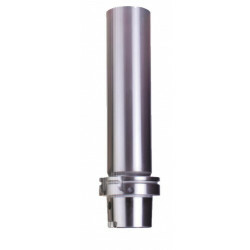 We here at ToolsEngg provide a wide array of shanks of boring bar blanks to purchase. What is Boring Bar Blank? Where can I buy Boring Bar Blank Online?